Visual literacy is not just about working out the meaning of visual images, but also expressing ourselves in visual form. I have a couple of favourite ways to explore this concept with kids that involve combining succinct text with well-chosen images. It doesn’t take much actual writing to write a caption, but the thinking and learning are considerable. Learning to write succinctly is important for all students. They also need to think about their audience and purpose for composing a caption. An enjoyable activity for home or classroom is to find interesting images, and ask kids to come up with captions to suit, or to demonstrate understanding. Grab some tips for doing this in Writing Fun for Kids - Create a Caption. The opportunities for self expression may be limited in choosing/creating images and creating and adding captions to them, but this is the sort of self expression and visual literacy activity that can be fitted into spare moments in a day. Websites we can use for adding captions are Big Huge Labs Captioner, PicFont and online image editors like Ribbet and PicMonkey. For an iPad app, try Phonto. A visual joke is sometimes another name for a sight gag, a theatrical or movie term. But here I mean it as a way of telling a joke using a digital image. It’s a lot like an image with a caption, and can be found too in cartoon format. Basically we want kids to concentrate on expressing themselves by using humour as a tool. The joke may be a drawing that accompanies text, a single frame cartoon, a play on words like a pun with an image that extends or explains the meaning. By choosing and telling a visual joke, kids are both expressing themselves, and connecting and communicating with others. Creating a cartoon online is hands-down one of my favourite ways to sneak some writing into children’s lives. Software like Comic Life is great, but don’t ignore the benefit of having kids explore sites like ToonDoo, Creaza and MakeBeliefsComix (all under adult supervision naturally.) Creating cartoons involves kids in developing characters, plots, settings and dialogue, and being able to express themselves, all in an achievable way. If you’re interested in creating digital cartoons with kids, check out my free PDF, Using Comic Editors with Kids. One of the iPad apps for creating comics I like is Comics Head; another is ToonToolKit. You will see samples of the latter in my post, Activities for Children’s Book Week, 2014. Tell a reluctant writer they are about to write a story and you may hear groans. But explain to them that their task is to set up scenes to photograph with a camera or iDevice, then add captions that help tell a story, and you may well hear cheers. In Visual Story Telling, I described my own process of telling a story using only five frames. A haiga is an image combined with a haiku. Haiku is a very condensed way of writing a poem that often only has 17 syllables. You can read about using haiku with kids here. Kids can use paper and paint, or create a digital haiga. 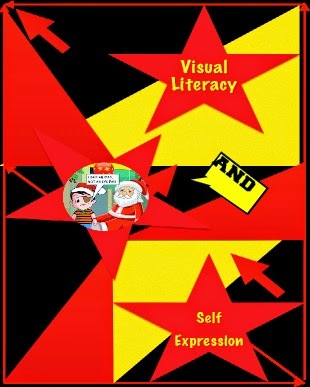 You’ll find more information in Poetry with Kids - Creating Haiga. As with haiku, six word memoirs force us to choose words carefully. We need to cram as much meaning as possible into our words, and create or choose an image that adds to that meaning. You can read more about it in Create Six Word Memoirs with Kids. Making posters is a tried and true classroom activity. Online poster makers make the creation of digital posters fairly easy, and children will learn lots of valuable skills during the process. They need to create or select images that convey meaning, select the textual details necessary to communicate their ideas, and carefully consider placement of images and text, font style and size. See some examples in my article, Online Poster Makers. The activities above CAN be achieved in a short time, but kids will benefit from lots of discussion and reflection time. When we think hard about what message we want to put out to the world, our communication takes on a purpose and very often a passion that lifts it above the mundane. I believe that kids will gain from simply playing with words and images, but I know they will learn even more when they think about a potential audience, a purpose and the many literacy concepts involved. Any form of self-expression is great for children’s imaginations, and feeds a very human desire to connect with others. Poetry with Kids - Presenting Haiga, Start Kids Writing with Fun Image Editors, and Use Images to Start Kids Thinking.